New TV Series Folders is a great collection that includes 23 high quality folder replacement icon featuring popular TV shows. The New TV Series Folders set allows you to give an original touch to your desktop no matter the file types or applications you choose to associate. 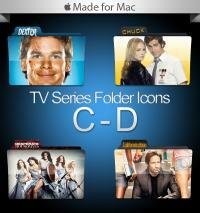 DOWNLOAD NEW TV SERIES FOLDERS NOW! Based on 5 ratings. 5 user reviews.